Each week on Thursdays we highlight a trustworthy discipleship resource that can help you in your mission to make disciples. This week’s post is “God is Our Shepherd” from the Bible Studies for Life curriculum. At the end of this post there is a link to sign up for a chance to win a free giveaway of this resource! Maps are good to direct you from one place to another, but you need to study them before leaving on a trip. If you don’t know the route well, you will need to stop periodically and double-check the map. GPS is better, but you still have to pay attention. You must glance continually at the screen to get a visual on how soon a turn is coming or listen intently to the verbal instructions. The best way to travel is with someone who knows the route well. A guide can anticipate things and remind you to “get in the left lane” or “be prepared for a sharp turn.” They often know shortcuts that the GPS is not clever enough to know. A guide can also provide “color commentary” as you travel, telling you interesting tidbits about places along the route. Let’s admit it: we all need a guide to get through life. Even when we think we have things figured out, life inserts a roadblock and the journey changes. But God does for us just as a shepherd does for his flock. God is our Good Shepherd who guides us on the right path and in the right direction. King David very well may have written Psalm 23 during the latter years of his reign as Israel’s king. It clearly has the ring of personal experience. It testifies to a faith tested by trials and a life mellowed and matured by the passing of years. David had experienced conflict—both internal and external—including wars; family division; and personal disappointments, discouragement, and despair. He faced issues that would equal or exceed anything we might experience today. His hands had been soiled by the murder of Uriah. His adulterous relationship with Bathsheba had ignited family fighting that led to ongoing conflict among family members. David experienced sin and the deep sorrow its consequences bring; he knew the pain of one son’s death and the rebellion of another who tried to take his kingdom. Yet this psalm affirms that, through it all, David knew God as his tender Shepherd. The imagery in this psalm may go back to David’s childhood experience of tending sheep. As a shepherd boy, David was deemed an unlikely candidate to become the king of Israel. It is significant that David the great warrior was drawn to a simple but assuring depiction of God as a gentle Shepherd caring for the needs of His flock. The profound impact of Psalm 23 is not discovering that God cares like a Shepherd, but the intimacy of the truth that He is my Shepherd. It is my Shepherd who “lets me lie down in green pastures”; who “leads me beside quiet waters.” David knew he belonged to the Lord and that gave him calm assurance in the midst of trials. When we are walking through dark valleys of doubt, discouragement, and difficulty, how good it is to know God is with us! The reality that our Shepherd is Sovereign God assures us that we will not only survive, we will thrive. Jesus, the Good Shepherd, declared that He had come “so that they may have life and have it in abundance” (John 10:10). We can live in victory no matter what circumstances and challenges life may bring our way. How have you seen God’s goodness and faithful love at work in your life? How will a relationship with the Good Shepherd make a difference in your life? If you are rushed and harried, it may be that you aren’t taking time for the Shepherd to feed you and restore your soul. Slow down and spend time in His Word. Make changes to your schedule to ensure more quality time in God’s Word. Excerpted from Ken Hemphill, Bible Studies for Life: God Is… © 2018 LifeWay Press®. Used by permission. Scripture quotations are taken from the Christian Standard Bible®. Copyright 2018 by Holman Bible Publishers. Used by permission. 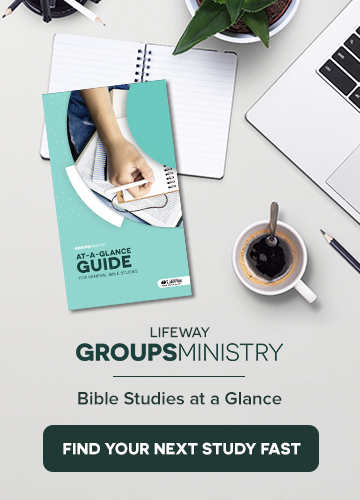 Click here and fill out the form before tomorrow night at 11:59pm for an opportunity to win a free bundle of this resource. The bundle includes 10 Bible Study Books and 1 Leader Kit.